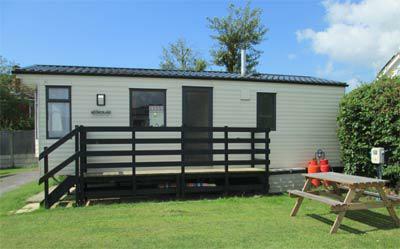 Our 2011 Westmoorland caravan is set in a quiet corner of Seadown Holiday Park; a small, family run holiday park with direct access to Charmouth beach, part of the world famous Jurassic coastline and a prime location for fossil hunting. Stonebarrow Hill and the south west coast path can be viewed from the caravans lounge area. The caravan sleeps 6. However, there are only two bedrooms, 1 double and 1 twin; there is a pull-out double bed in the lounge. The kitchen is fully equipped, with a fridge, microwave, kettle, toaster and gas hob with double oven. In the lounge there is a 26inch HD ready TV with integrated DVD player along with a gas fire. There is an electric radiator in the shower room and warm air heating in the bedrooms. Outside seating is provided and there is parking for 1 car. Duvets, pillows and mattress protectors are provided, but please bring your own linen and towels. Dogs are allowed at owners discretion and for an extra charge of £10.00 per dog per week. Lyme Regis with its famous Cobb is a short drive away, as is the small town of Bridport with its popular Saturday market. There is also the market town of Axminster with the River Cottage canteen at its heart. Charmouth itself has two public houses, shops and cafes. The Park has its own on site shop and laundry room. Charmouth beach is the perfect place for a good old fashioned bucket and spade and rock pooling holiday for the children, together with the added excitement of fossil hunting.